Recorded/performed at: ABC Waverley Theatre Studios, Melbourne, on 1993. Ernie Althoff Michael Kieran Harvey 1 mins, 59 sec. Recorded/performed at: ABC Waverley Theatre Studios, Melbourne, on 1993. Dalmazio Babare Michael Kieran Harvey 1 mins, 29 sec. Recorded/performed at: ABC Waverley Theatre Studios, Melbourne, on 1993. Amelia Barden Michael Kieran Harvey 1 mins, 54 sec. Recorded/performed at: ABC Waverley Theatre Studios, Melbourne, on 1993. Ross Bolleter Michael Kieran Harvey 1 mins, 1 sec. Recorded/performed at: ABC Waverley Theatre Studios, Melbourne, on 1993. Brenton Broadstock Michael Kieran Harvey 1 mins, 2 sec. Recorded/performed at: ABC Waverley Theatre Studios, Melbourne, on 1993. Warren Burt Michael Kieran Harvey 52 sec. Recorded/performed at: ABC Waverley Theatre Studios, Melbourne, on 1993. Ann Carr-Boyd Michael Kieran Harvey 1 mins, 18 sec. Recorded/performed at: ABC Waverley Theatre Studios, Melbourne, on 1993. Linda Ceff Michael Kieran Harvey 2 mins, 17 sec. Recorded/performed at: ABC Waverley Theatre Studios, Melbourne, on 1993. David Chesworth Michael Kieran Harvey 43 sec. Recorded/performed at: ABC Waverley Theatre Studios, Melbourne, on 1993. Carolyn Connors Michael Kieran Harvey 59 sec. Recorded/performed at: ABC Waverley Theatre Studios, Melbourne, on 1993. Tim Dargaville Michael Kieran Harvey 3 mins, 49 sec. Recorded/performed at: ABC Waverley Theatre Studios, Melbourne, on 1993. Stuart Davies-Slate Michael Kieran Harvey 48 sec. Recorded/performed at: ABC Waverley Theatre Studios, Melbourne, on 1993. Roger Dean Michael Kieran Harvey 1 mins, 39 sec. Recorded/performed at: ABC Waverley Theatre Studios, Melbourne, on 1993. Sarah De Jong Michael Kieran Harvey 47 sec. Recorded/performed at: ABC Waverley Theatre Studios, Melbourne, on 1993. Graeme Gerrard Michael Kieran Harvey 1 mins, 11 sec. Recorded/performed at: ABC Waverley Theatre Studios, Melbourne, on 1993. Peter Graham Michael Kieran Harvey 36 sec. Recorded/performed at: ABC Waverley Theatre Studios, Melbourne, on 1993. Andrée Greenwell Michael Kieran Harvey 1 mins, 12 sec. Recorded/performed at: ABC Waverley Theatre Studios, Melbourne, on 1993. Lawrence Harvey Michael Kieran Harvey 1 mins, 44 sec. Recorded/performed at: ABC Waverley Theatre Studios, Melbourne, on 1993. Ross Hazeldine Michael Kieran Harvey 1 mins, 22 sec. Recorded/performed at: ABC Waverley Theatre Studios, Melbourne, on 1993. Hartley Hewnham Michael Kieran Harvey 1 mins, 36 sec. Recorded/performed at: ABC Waverley Theatre Studios, Melbourne, on 1993. Stephen Holgate Michael Kieran Harvey 1 mins, 39 sec. 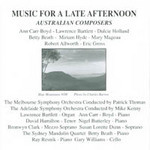 Recorded/performed at: ABC Waverley Theatre Studios, Melbourne, on 1993. Neil Kelly Michael Kieran Harvey 1 mins, 2 sec. Recorded/performed at: ABC Waverley Theatre Studios, Melbourne, on 1993. Sheila Learmonth Michael Kieran Harvey 4 mins, 8 sec. Recorded/performed at: ABC Waverley Theatre Studios, Melbourne, on 1993. Stephen Leek Michael Kieran Harvey 1 mins, 29 sec. Recorded/performed at: ABC Waverley Theatre Studios, Melbourne, on 1993. Rainer Linz Michael Kieran Harvey 3 mins, 10 sec. Recorded/performed at: ABC Waverley Theatre Studios, Melbourne, on 1993. Christine McCombe Michael Kieran Harvey 3 mins, 9 sec. Recorded/performed at: ABC Waverley Theatre Studios, Melbourne, on 1993. Peter Myers Michael Kieran Harvey 1 mins, 2 sec. Recorded/performed at: ABC Waverley Theatre Studios, Melbourne, on 1993. Cuong Nguyen Michael Kieran Harvey 25 sec. Recorded/performed at: ABC Waverley Theatre Studios, Melbourne, on 1993. Mark Pollard Michael Kieran Harvey 1 mins, 34 sec. Recorded/performed at: ABC Waverley Theatre Studios, Melbourne, on 1993. Jeff Pressing Michael Kieran Harvey 1 mins, 18 sec. Recorded/performed at: ABC Waverley Theatre Studios, Melbourne, on 1993. Thomas Reiner Michael Kieran Harvey 31 sec. Recorded/performed at: ABC Waverley Theatre Studios, Melbourne, on 1993. Greg Schiemer Michael Kieran Harvey 2 mins, 10 sec. Recorded/performed at: ABC Waverley Theatre Studios, Melbourne, on 1993. Andrew Schultz Michael Kieran Harvey 4 mins, 8 sec. Recorded/performed at: ABC Waverley Theatre Studios, Melbourne, on 1993. Larry Sitsky Michael Kieran Harvey 3 mins, 1 sec. Recorded/performed at: ABC Waverley Theatre Studios, Melbourne, on 1993. Caroline Szeto Michael Kieran Harvey 34 sec. Recorded/performed at: ABC Waverley Theatre Studios, Melbourne, on 1993. Joerg Todzy Michael Kieran Harvey 1 mins, 28 sec. Recorded/performed at: ABC Waverley Theatre Studios, Melbourne, on 1993. Richard Vella Michael Kieran Harvey 2 mins, 36 sec. Recorded/performed at: ABC Waverley Theatre Studios, Melbourne, on 1993. Lindsay Vickery Michael Kieran Harvey 40 sec. Recorded/performed at: ABC Waverley Theatre Studios, Melbourne, on 1993. Allan Walker Michael Kieran Harvey 47 sec. Recorded/performed at: ABC Waverley Theatre Studios, Melbourne, on 1993. Mal Webb Michael Kieran Harvey 1 mins, 6 sec. Recorded/performed at: ABC Waverley Theatre Studios, Melbourne, on 1993. Julian Yu Michael Kieran Harvey 50 sec. Liner notes include brief biographies. 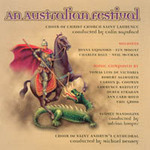 CD: Mosaics / Melbourne Composers' League.